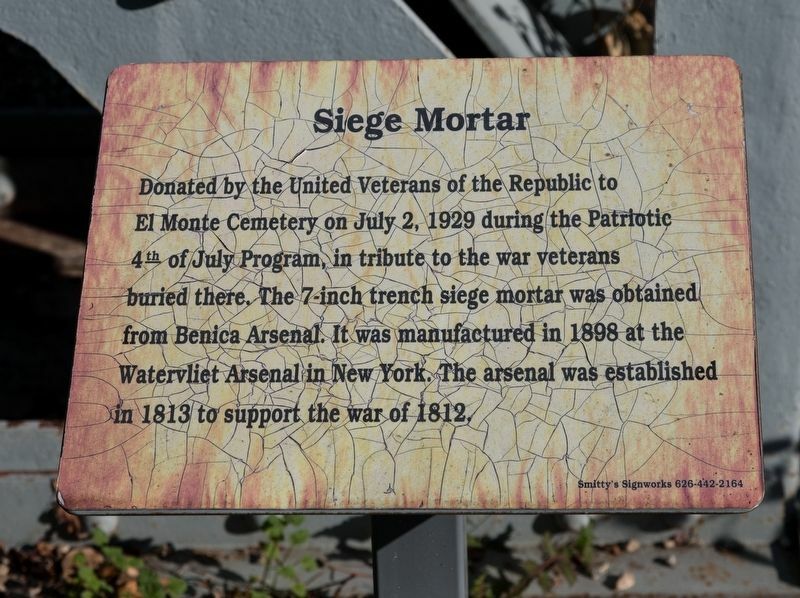 Donated by the United Veterans of the Republic to El Monte Cemetery on July 2, 1929 during the Patriotic 4th of July Program, in tribute to the war veterans buried there, The 7-inch trench siege mortar was obtained from Benica Arsenal. It was manufactured in 1898 at the Watervlet Arsenal in New York. The arsenal established in 1813 to support the war of 1812. Location. 34° 4.906′ N, 118° 4.047′ W. Marker is in Rosemead, California, in Los Angeles County. Marker can be reached from Valley Boulevard near Loma Avenue. Touch for map. It is in the Savannah Cemetery. Marker is at or near this postal address: 9263 Valley Blvd, Rosemead CA 91770, United States of America. Touch for directions. 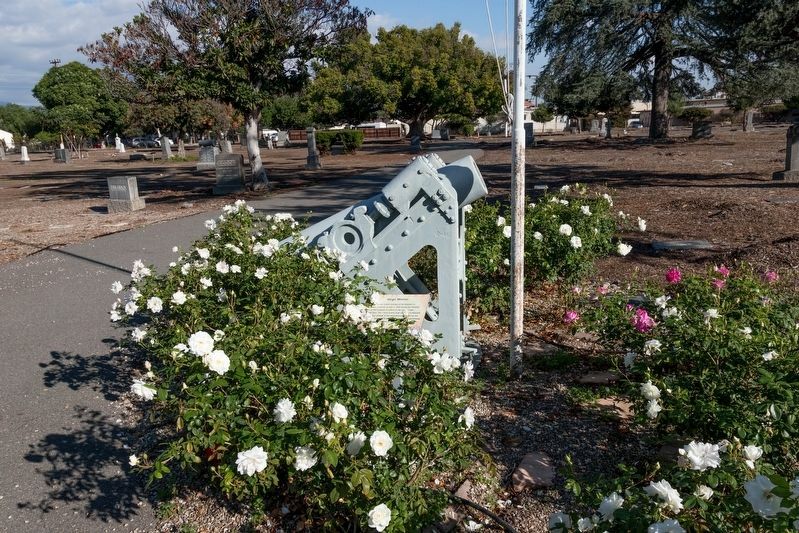 Marker is between the rose bush and the mortar. (approx. 1.6 miles away); The Lion (approx. 2.2 miles away); Gay’s Lion Farm (approx. 2.4 miles away). Touch for a list and map of all markers in Rosemead. 3. 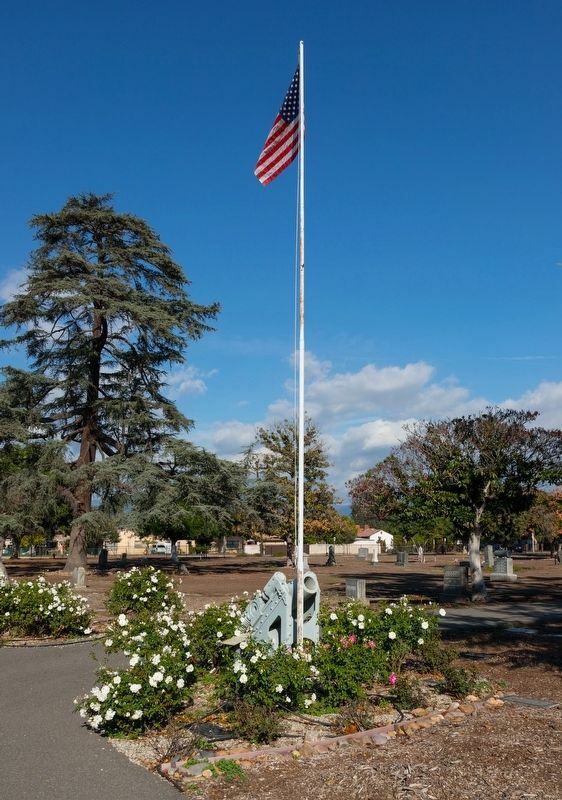 Siege Mortar and Flag Pole at Savannah Memorial Park, Rosemead, Ca. More. Search the internet for Siege Mortar. Credits. This page was last revised on March 31, 2019. This page originally submitted on March 31, 2019, by J. J. Prats of Powell, Ohio. This page has been viewed 84 times since then. Photos: 1, 2, 3. submitted on March 31, 2019, by J. J. Prats of Powell, Ohio.